Although oil revenues contribute 2/3 of state revenues, oil only contributes about 9% to the GDP. Nigeria produces only about 2.7% of the world's oil supply (in comparison, Saudi Arabia produces 12.9%, Russia produces 12.7% and the United States produces 8.6%). Although the petroleum sector is important, as government revenues still heavily rely on this sector, it remains a small part of the country's overall economy. The largely subsistence agricultural sector has not kept up with rapid population growth, and Nigeria, once a large net exporter of food, now[when?] imports some of its food products, though mechanization has led to a resurgence in manufacturing and exporting of food products, and the move towards food sufficiency. In 2006, Nigeria successfully convinced the Paris Club to let it buy back the bulk of its debts owed to them for a cash payment of roughly US$12 billion. According to a Citigroup report published in February 2011, Nigeria will have the highest average GDP growth in the world between 2010 and 2050. Nigeria is one of two countries from Africa among 11 Global Growth Generators countries. In 2014, Nigeria changed its economic analysis to account for rapidly growing contributors to its GDP, such as telecommunications, banking, and its film industry. In 2005, Nigeria achieved a milestone agreement with the Paris Club of lending nations to eliminate all of its bilateral external debt. Under the agreement, the lenders will forgive most of the debt, and Nigeria will pay off the remainder with a portion of its energy revenues. Outside of the energy sector, Nigeria's economy is highly inefficient. Moreover, human capital is underdeveloped—Nigeria ranked 151 out of countries in the United Nations Development Index in 2004—and non-energy-related infrastructure is inadequate. From 2003 to 2007, Nigeria attempted to implement an economic reform program called the National Economic Empowerment Development Strategy (NEEDS). The purpose of the NEEDS was to raise the country's standard of living through a variety of reforms, including macroeconomic stability, deregulation, liberalization, privatization, transparency, and accountability. The NEEDS addressed basic deficiencies, such as the lack of freshwater for household use and irrigation, unreliable power supplies, decaying infrastructure, impediments to private enterprise, and corruption. The government hoped that the NEEDS would create 7 million new jobs, diversify the economy, boost non-energy exports, increase industrial capacity utilization, and improve agricultural productivity. A related initiative on the state level is the State Economic Empowerment Development Strategy (SEEDS). A longer-term economic development program is the United Nations (UN)-sponsored National Millennium Goals for Nigeria. Under the program, which covers the years from 2000 to 2015, Nigeria is committed to achieving a wide range of ambitious objectives involving poverty reduction, education, gender equality, health, the environment, and international development cooperation. In an update released in 2004, the UN found that Nigeria was making progress toward achieving several goals but was falling short on others. Specifically, Nigeria had advanced efforts to provide universal primary education, protect the environment, and develop a global development partnership. A prerequisite for achieving many of these worthwhile objectives is curtailing endemic corruption, which stymies development and taints Nigeria's business environment. President Olusegun Obasanjo's campaign against corruption, which includes the arrest of officials accused of misdeeds and recovering stolen funds, has won praise from the World Bank. In September 2005, Nigeria, with the assistance of the World Bank, began to recover US$458 million of illicit funds that had been deposited in Swiss banks by the late military dictator Sani Abacha, who ruled Nigeria from 1993 to 1998. However, while broad-based progress has been slow, these efforts have begun to become evident in international surveys of corruption. In fact, Nigeria's ranking has consistently improved since 2001 ranking 147 out of 180 countries in Transparency International's 2007 Corruption Perceptions Index. The Nigerian economy suffers from an ongoing supply crisis in the power sector. Despite a rapidly growing economy, some of the world's largest deposits of coal, oil and gas and the country's status as Africa's largest oil producer, power supply difficulties are frequently experienced by residents. This is a chart of trend of gross domestic product of Nigeria at market prices estimated by the International Monetary Fund with figures in USD billions. Figures before 2000 are backwards projections from the 2000–2012 numbers, based on historical growth rates, and should be replaced when data becomes available. The figure for 2014 is derived from a rebasing of economical activity earlier in the year. The US dollar exchange rate is an estimated average of the official rate throughout a year, and does not reflect the parallel market rate at which the general population accesses foreign exchange. This rate ranged from a high of 520 in March 2017 to a low of 350 in August 2017, due to a scarcity of forex (oil earnings had dropped by half), and to speculative activity as alleged by the Central Bank. All the while the official rate was pegged at 360. Per capita income (as % of USA) is calculated using data from estimates in the PPP link above, and from census estimates, based on growth rates between census periods. For instance 2017 GDPs were 1,125 Billion (Nigeria) vs. 19,417 Billion (USA) and populations were estimated at 320 million vs 190 million. The ratio is therefore (1125/19417) / (190/320), which roughly comes to 0.0975. These are estimates and are intended to get a feel for the relative wealth and standard of living, as well as the market potential of its middle class. This is a chart of trend of the global ranking of the Nigerian economy, in comparison with other countries of the world, derived from the historical List of countries by GDP (PPP). For purchasing power parity comparisons, the US dollar is exchanged at 1 USD to 314.27 Nigerian Naira (as of 2017). Current GDP per capita of Nigeria expanded 132% in the sixties reaching a peak growth of 283% in the seventies. But this proved unsustainable and it consequently shrank by 66% in the Eighties. In the Nineties, diversification initiatives finally took effect and decadal growth was restored to 10%. Although GDP on a PPP basis did not increase until the 2000's. In 2005 Nigeria's inflation rate was an estimated 15.6%. Nigeria's goal under the National Economic Empowerment Development Strategy (NEEDS) program is to reduce inflation to the single digits. By 2015, Nigeria's inflation stood at 9%. In 2005, the federal government had expenditures of US$13.54 billion but revenues of only US$12.86 billion, resulting in a budget deficit of 5%. By 2012, expenditures stood at $31.61 billion, while revenues was $54.48 billion. 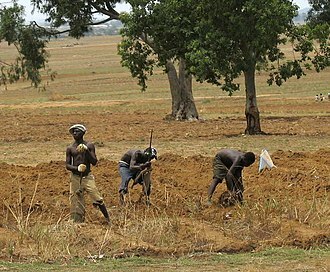 Nigerian farmers in the Middle Belt (2006). 30% of Nigerians are employed in agriculture. Nigeria ranks sixth worldwide and first in Africa in farm output. The sector accounts for about 18% of GDP and almost one-third of employment. Nigeria has 19 million head of cattle, the largest in Africa. Though Nigeria is no longer a major exporter, due to local consumer boom, it is still a major producer of many agricultural products, including: cocoa, groundnuts (peanuts), rubber, and palm oil. Cocoa production, mostly from obsolete varieties and overage trees has increased from around 180,000 tons annually to 350,000 tons. Major agricultural products include cassava (tapioca), corn, cocoa, millet, palm oil, peanuts, rice, rubber, sorghum, and yams. In 2003, livestock production, in order of metric tonnage, featured eggs, milk, beef and veal, poultry, and pork, respectively. In the same year, the total fishing catch was 505.8 metric tons. Roundwood removals totaled slightly less than 70 million cubic meters, and sawnwood production was estimated at 2 million cubic meters. The agricultural sector suffers from extremely low productivity, reflecting reliance on antiquated methods. Agriculture has failed to keep pace with Nigeria's rapid population growth, so that the country, which once exported food, now imports a significant amount of food to sustain itself. However, efforts are being made towards making the country food sufficient again. Nigeria's proven oil reserves are estimated to be 35 billion barrels (5.6×109 m3); natural gas reserves are well over 100 trillion cubic feet (2,800 km3). Nigeria is a member of the Organization of Petroleum Exporting Countries (OPEC). The types of crude oil exported by Nigeria are Bonny light oil, Forcados crude oil, Qua Ibo crude oil and Brass River crude oil. Poor corporate relations with indigenous communities, vandalism of oil infrastructure, severe ecological damage, and personal security problems throughout the Niger Delta oil-producing region continue to plague Nigeria's oil sector. Efforts are underway[when?] to reverse these troubles. A new entity, the Niger Delta Development Commission (NDDC), has been created to help catalyze economic and social development in the region. The U.S. remains Nigeria's largest buyer of crude oil, accounting for 40% of the country's total oil exports; Nigeria provides about 10% of overall U.S. oil imports and ranks as the fifth-largest source for U.S. imported oil. The United Kingdom is Nigeria's largest trading partner followed by the United States. Although the trade balance overwhelmingly favors Nigeria, thanks to oil exports, a large portion of U.S. exports to Nigeria is believed to enter the country outside of the Nigerian government's official statistics, due to importers seeking to avoid Nigeria's tariffs. To counter smuggling and under-invoicing by importers, in May 2001, the Nigerian government instituted a full inspection program for all imports, and enforcement has been sustained. On the whole, Nigerian high tariffs and non-tariff barriers are gradually being reduced,[when?] but much progress remains to be made. [according to whom?] The government also has been encouraging the expansion of foreign investment, although the country's investment climate remains daunting to all but the most determined. [according to whom?] The stock of U.S. investment is nearly $7 billion, mostly in the energy sector. Exxon Mobil and Chevron are the two largest U.S. corporations in offshore oil and gas production. Significant exports of liquefied natural gas started in late 1999 and are slated to expand as Nigeria seeks to eliminate gas flaring by 2008. The pump price of P.M.S. currently[when?] stands at around ₦145 at fueling stations across Nigeria. An initial increase in the price of petrol (Premium Motor Spirit) from around ₦65 to ₦140 triggered by the removal of fuel subsidies on January 1, 2012, triggered a total strike and massive protests across the country. Then President Goodluck Ebele Jonathan later reached an agreement with the Nigerian Labour Congress and reduced the pump price to 97 naira. The pump price was further reduced by 10 naira to 87 naira in the run-up to the 2015 general elections. However, after the elections of Muhammadu Buhari, the fuel subsidies was removed again, and the pump price increased again, despite the fall in oil price. Since the fall in oil prices in 2015 and 2016, the government exchange rate policy has limited devaluation of the naira due to inflation concerns by the President Muhammadu Buhari. Since undergoing severe distress in the mid-1990s, Nigeria's banking sector has witnessed significant growth over the last few years[when?] as new banks enter the financial market. Nigeria's publicly owned transportation infrastructure is a major constraint to economic development. Principal ports are at Lagos (Apapa and Tin Can Island), Port Harcourt (Onne), and Calabar. Extensive road repairs and new construction activities are gradually being implemented as state governments, in particular, spend their portions of enhanced government revenue allocations. Five of Nigeria's airports (Lagos, Kano, Port Harcourt, Enugu and Abuja) currently fly to international destinations. The Nigerian Airforce began a new airline called United Nigeria, with a Boeing 737-500 in 2013. There are several domestic private Nigerian carriers, and air service among Nigeria's cities is generally dependable. A major source of foreign exchange earnings for Nigeria are remittances sent home by Nigerians living abroad. In 2014, 17.5 million Nigerians lived in foreign countries, with the UK and the USA having more than 2 million Nigerians each. In 2015, Nigeria had a labour force of 74 million. In 2003, the unemployment rate was 10.8% overall; by 2015, unemployment stood at 6.4%. Since 1999, the Nigerian Labor Congress (NLC) a union umbrella organization, has called six general strikes to protest domestic fuel price increases. However, in March 2005 the government introduced legislation ending the NLC's monopoly over union organizing. In December 2005, the NLC was lobbying for an increase in the minimum wage for federal workers. The existing minimum wage, which was introduced six years earlier but has not been adjusted since, has been whittled away by inflation to only US$42.80 per month. According to the International Organization for Migration, the number of immigrants residing in Nigeria has more than doubled in recent decades – from 477,135 in 1991 to 971,450 in 2005. The majority of immigrants in Nigeria (74%) are from neighbouring Economic Community of West African States (ECOWAS), and that this number has increased considerably over the last decade, from 63% in 2001 to 97% in 2005. The Human Development Index (HDI) shows in 2012 that Nigeria is ranked 156 with the value of 0.459 among 187 countries. As of 2015, Nigeria's HDI is ranked 152nd at 0.514. The comparative value for Sub-Saharan Africa is 0.475, 0.910 for the US, and 0.694 for the world average. The value for the education index is 0.457, compared to the average in the US of 0.939. The expected years of schooling in Nigeria is 9.0 (16.00 in the US), while the mean years of schooling for adults over 25 years is 5.2 years (12.4 years in the US). Additionally, Nigeria is also facing a relatively high inequality, worsening the problem regarding the formation of human capital. The income distribution for the poorest (bottom 10%) is 1.6% while it is 40.8% for the richest (top 10%). Among 114 countries the income distribution places Nigeria respectively in 94th position for the poorest and 17th for the richest. In the light of highly expansionary public sector fiscal policies in 2001, the government sought ways to head off higher inflation, leading to the implementation of stronger monetary policies by the Central Bank of Nigeria (CBN) and underspending of budgeted amounts. As a result of the CBN's efforts, the official exchange rate for the Naira has stabilized at about 112 Naira to the dollar. The combination of CBN's efforts to prop up the value of the Naira and excess liquidity resulting from government spending led the currency to be discounted by around 20% on the parallel (non-official) market. A key condition of the Stand-by Arrangement has been closure of the gap between the official and parallel market exchange rates. The Inter Bank Foreign Exchange Market (IFEM) is closely tied to the official rate. Under IFEM, banks, oil companies, and the CBN can buy or sell their foreign exchange at government-influenced rates. Much of the informal economy, however, can only access foreign exchange through the parallel market. Companies can hold domiciliary accounts in private banks, and account holders have unfettered use of the funds. Expanded government spending also has led to upward pressure on consumer prices. Inflation which had almost disappeared in April 2000 reached 14.5% by the end of the year and 18.7% in August 2001. In 2000, high oil prices resulted in government revenue of over $16 billion, about double the 1999 level. State and local governments demanded access to this "windfall" revenue, creating a tug-of-war between the federal government, which sought to control spending, and state governments desiring augmented budgets, preventing the government from making provision for periods of lower oil prices. In 2016, the black market exchange rate of the Naira was about 60% above the official rate. The central bank releases about $200 million each week at the official exchange rate. However, some companies cite that budgets now include a 30% “premium” to be paid to central bank officials to get dollars. The Obasanjo government supported "private-sector" led, "market oriented" economic growth and began extensive economic reform efforts. Although the government's anti-corruption campaign was left wanting, progress in injecting transparency and accountability into economic decision-making was notable. The dual exchange rate mechanism formally abolished in the 1999 budget remains in place in actuality. During 2000 the government's privatization program showed signs of life and real promise with successful turnover to the private sector of state-owned banks, fuel distribution companies, and cement plants. However, the privatization process has slowed somewhat as the government confronts key parastatals such as the state telephone company NITEL and Nigerian Airways. The successful auction of GSM telecommunications licenses in January 2001 has encouraged investment in this vital sector. Although the government has been stymied so far in its desire to deregulate downstream petroleum prices, state refineries, almost paralyzed in 2000, are producing at much higher capacities. By August 2001, gasoline lines disappeared throughout much of the country. The government still intends to pursue deregulation despite significant internal opposition, particularly from the Nigeria Labour Congress. To meet market demand the government incurs large losses importing gasoline to sell at subsidized prices. Nigeria's foreign economic relations revolve around its role in supplying the world economy with oil and natural gas, even as the country seeks to diversify its exports, harmonize tariffs in line with a potential customs union sought by the Economic Community of West African States (ECOWAS), and encourage inflows of foreign portfolio and direct investment. In October 2005, Nigeria implemented the ECOWAS common external tariff, which reduced the number of tariff bands. Prior to this revision, tariffs constituted Nigeria's second largest source of revenue after oil exports. In 2005 Nigeria achieved a major breakthrough when it reached an agreement with the Paris Club to eliminate its bilateral debt through a combination of write-downs and buybacks. Nigeria joined the Organization of the Petroleum Exporting Countries in July 1971 and the World Trade Organization in January 1995. A proportional representation of Nigeria's exports. In 2017, Nigeria imported about US$34.2 billion of goods. In 2017 the leading sources of imports were China (28%), the Belgium-Luxembourg (8.9%), the Netherlands (8.3%), South Korea (6.4%), the United States (6.0%) and the Republic of India (4.6%). Principal imports were manufactured goods, machinery and transport equipment, chemicals, and food and live animals. In 2017, Nigeria exported about US$46.68 billion of goods. In 2017, the leading destinations for exports were India (18%), the United States (14%), Spain (9.7%), France (6.0%) and the Netherlands (4.9%). In 2017 oil accounted for 83% of merchandise exports. Natural rubber and cocoa are the country’s major agricultural exports. In 2005, Nigeria posted a US$26 billion trade surplus, corresponding to almost 20% of gross domestic product. In 2005, Nigeria achieved a positive current account balance of US$9.6 billion. The Nigerian currency is the naira (NGN). As of mid-June 2006, the exchange rate was about US$1=NGN128.4. In recent years, Nigeria has expanded its trade relations with other developing countries such as India. Nigeria is the largest African crude oil supplier to India — it annually exports 400,000 barrels per day (64,000 m3/d) to India valued at US$10 billion annually. India is the largest purchaser of Nigeria's oil which fulfills 20% to 25% of India's domestic oil demand. Indian oil companies are also involved in oil drilling operations in Nigeria and have plans to set up refineries there. The trade volume between Nigeria and the United Kingdom rose by 35% from USD6.3 billion in 2010 to USD8.5 billion in 2011. In 2012, Nigeria's external debt was an estimated $5.9 billion and N5.6 trillion domestic - putting total debt at $44 billion. In April 2006, Nigeria became the first African country to fully pay off its debt owed to the Paris Club. This was structured as a debt writeoff of approximately $18 billion and a cash payment of approximately $12 billion. In 2012, Nigeria received a net inflow of US$85.73 billion of foreign direct investment (FDI), much of which came from Nigerians in the diaspora. Most FDI is directed toward the energy and banking sectors. Any public designed to encourage inflow of foreign capital is capable of generating employment opportunities within the domestic economy. The Nigerian Enterprises Promotion (NEP) Decree of 1972 (revised in 1977) was intended to reduce foreign investment in the Nigerian economy. The stock market capitalisation of listed companies in Nigeria was valued at $97.75 billion on 15 February 2008 by the Nigerian Stock Exchange. The Swiss foreign ministry says it has done all it can to ensure that funds stolen by the late Nigerian dictator Sani Abacha were used properly in his homeland. The authorities were responding to allegations that $200 million (SFr240 million) of $700 million handed back by the Swiss Banks to Nigeria had been misappropriated. ^ "Glossary -- Nigeria". Retrieved 22 June 2015. ^ a b c d "World Economic Outlook Database, October 2018". IMF.org. International Monetary Fund. Retrieved 8 February 2019. ^ a b c d "The World Factbook". CIA.gov. Central Intelligence Agency. Retrieved 8 February 2019. ^ "Nigeria's unemployment rate rises to 23.1% – NBS". Premium Times. December 2018. Archived from the original on 2 October 2015. Retrieved 14 February 2019. ^ "Nigeria's unemployment rate rises to 23.1% – NBS". Premium Times. 19 December 2018. Retrieved 14 February 2019. ^ a b "Nigerian Gross Domestic Product Report Q2 2015". National Bureau of Statistics. Archived from the original on 15 September 2015. Retrieved 22 September 2015. ^ "Doing Business in Nigeria 2012". Doing Business,org. Retrieved 31 January 2017. ^ a b c "Nigeria facts and figures". www.opec.org. OPEC. Retrieved 30 March 2019. ^ a b c d e f "Nigeria". The Observatory of Economic Complexity. Retrieved 30 March 2019. ^ a b "Foreign Trade Statistics". National Bureau of Statistics. 2015. Archived from the original on 15 September 2015. Retrieved 22 September 2015. ^ "DEBT - EXTERNAL". CIA.gov. Central Intelligence Agency. Retrieved 28 December 2018. ^ "Nigeria's external debt to W'Bank, AfDB, others hit N1.63trn". Sun News. 24 February 2015. Archived from the original on 22 June 2015. Retrieved 22 June 2015. ^ a b Rogers, Simon; Sedghi, Ami (15 April 2011). "How Fitch, Moody's and S&P rate each country's credit rating". The Guardian. London. Retrieved 31 May 2011. ^ "Manufacturing Sector Report, 2015: Manufacturing in Africa" (PDF). KPMG. 2015. Archived from the original (PDF) on 27 September 2016. Retrieved 18 November 2016. ^ "nigeria rebasing gdp - Google Search". Retrieved 11 June 2015. ^ "Subscribe to read". www.ft.com. Retrieved 2 June 2017. ^ "Resolving Nigeria's Debt Through a Discounted Buyback". Center For Global Development. Retrieved 11 June 2015. ^ "Africa's new Number One". Economist.com. Retrieved 9 April 2017. ^ "Your daily Naira exchange rate". www.abokifx.com. Retrieved 23 August 2017. ^ "Daily Parallel Market Exchange Rate". www.nairametrics.com. Retrieved 23 August 2017. ^ "XE: Convert USD/NGN. United States Dollar to Nigeria Naira". www.xe.com. Retrieved 2 June 2017. ^ "factfish Gross domestic product per capita, constant 2005 US $ for Nigeria". factfish.com. Retrieved 10 April 2018. ^ "News 2012". Nigerian National Bureau of Statistics. Retrieved 26 March 2012. ^ "Nigeria to Increase Beef Consumption to 1.3 Million Tonnes By 2050 - Adesina". 16 May 2014. Retrieved 9 April 2017 – via AllAfrica. ^ a b "Can you spare a dollar?". The Economist. ISSN 0013-0613. Retrieved 20 March 2016. ^ Sotubo, 'Jola. "Buhari: Why President should devalue naira – Chuba Ezekwesili [VIDEO]". pulse.ng. Retrieved 20 March 2016. ^ Onuba, Ifeanyi (15 May 2015). "Only 4.67 million Nigerians are unemployed —NBS". The Punch Newspaper. Archived from the original on 26 May 2015. Retrieved 17 May 2015. ^ "India now Nigeria's biggest crude oil buyer". The Hindu. Chennai, India. 15 July 2013. ^ "Nigeria's Domestic, External Debts Now $44bn, Articles - THISDAY LIVE". Archived from the original on 13 June 2015. Retrieved 11 June 2015.